La Jolla sewage spill closes Windandsea Beach. 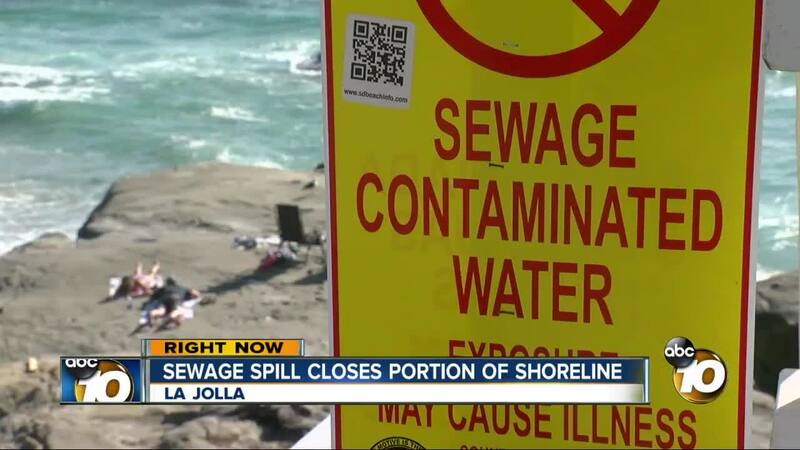 SAN DIEGO (KGTV) — County officials closed a portion of La Jolla's coastline after a sewage spill Friday morning. The closure was issued for the area of Playa Del Norte in Windansea, near the 7000 block of Neptune Pl., after a sewage spilled before 9:30 a.m. Seven year La Jolla resident Marc Hirschfield said he was walking his dogs Saturday morning when he noticed the yellow warning signs dotting the beach and asked lifeguards what happened. He said they told him "there was a manhole cover that overflowed and raw sewage spilled into the ocean." Lifeguards told 10News it was a storm drain to blame in the same area. The spill has been contained, according to the County Department of Environmental Health, but there still may be impacts to water quality after 130 gallons of sewage entered the beach area. Warning signs have been placed in the area until samples of the ocean water indicate the water is safe for recreational use. It's not clear how long the area will remain closed. Some beach-goers ignored the signs, others, like surfer Cole Reiner just didn't see them. "Well I went out into the water. I mean contaminated doesn’t sound great, but I was out there and it says may cause illness so that’s not great," he said. Lifeguards couldn't say when the beach would reopen. As of 4:30p.m. the county said the beach was still closed. "City life guards recommend 72 hours so for me it’ll probably be 48," HIrschfield said.